I wrote yesterday, ahead of the Met Gala, that since Selena Gomez would be repping Coach, I wasn’t expecting her to really be a major player on the red carpet because Coach hasn’t really delivered in the high fashion game. But then Letitia Wright showed up. In Coach. For her first ever Met Gala. And on Letitia Wright, Coach definitely delivered in the high fashion game. So…why can’t they do the same for Selena? Selena took the virgin angel bride approach to the Heavenly Bodies theme last night. Let’s call it what it is though: a glorified negligee. Which is not NOT on theme. It is, actually, on theme. 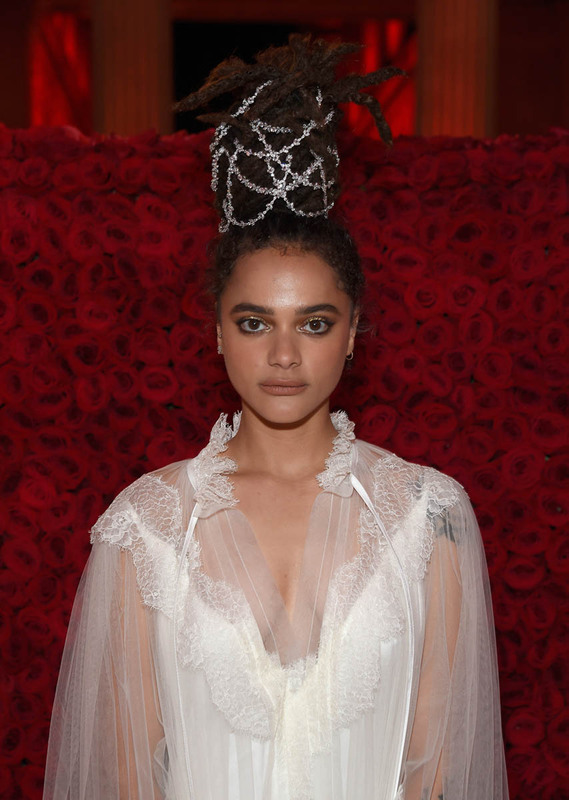 (Sasha Lane totally nailed the vibe that Selena was going for.) The problem is the styling. And the fit. You can do a fashion negligee as long as there’s structure. I don’t see that much structure happening here on Selena. And I am so f-cking mad at the hair. I mean if you’re going to go virgin bride, take it all the way – show me that hair tumbling all around her shoulders, give me a veil, why is her hair gathered up like this, how is this in any way fresh? The look simply did not translate. And so, in combination with the dress, and the hair, overall for Selena, disappointingly, once again it was an underwhelming showing at the Met Gala. Which means we have to wait. Because she is fully capable of a Met Gala moment. It’s coming. Eventually it will happen. Maybe… when she’s invited to co-chair? That will happen too. In other Selena news, what do we have here? It’s Selena and Gigi, sister of Bella, who used to date The Weeknd. All good now then? Selena and Kylie Jenner, sister of Kim Kardashian, married to Kanye, enemy of Taylor Swift, friend of Selena Gomez.